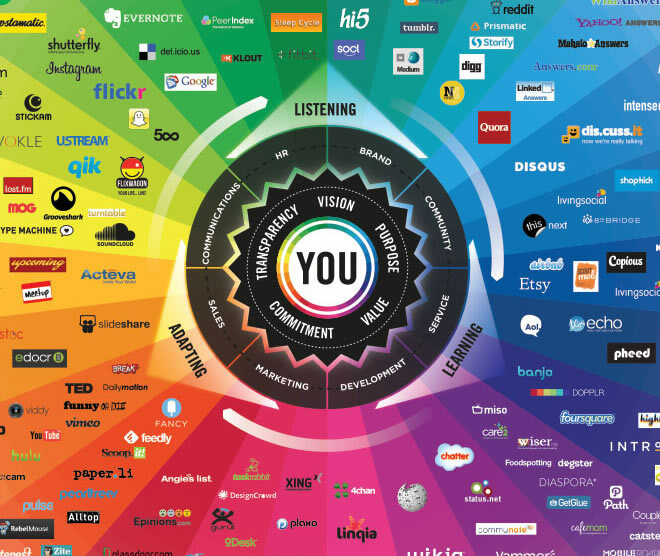 Brian Solis’s latest Conversation Prism illustrates the increasing complexity of Social Media content management. Brian Solis recently updated his hugely popular Conversation Social Prism which charts the best known channels in the social media spectrum. Dozens of major social channels have been categorized under 26 distinct headings representing social’s broad range of interests. The list includes the best known, not every social channel on the web. It’s an eye-opening experience trying to comprehend the near limitless opportunities he presents while deciding on priorities. To get an idea of how far digital media has come, you might want to compare his prism to my web universe sketched only four years ago. The two most popular platforms for individualized content publishing are brand-here-dot-com websites and/or blogs. Blogs are dynamic, while publishing as a straight html web page tends to be more cumbersome even though it allows greater flexibility. It’s a trade-off that should be considered with an eye towards time management, creative skills, and frequency. Social sites are also widely used for content, but are restricted in one form or another as to length and type of content. To put all your eggs in one basket, i.e. Facebook, places the cart before the horse. Pinterest, SlideShare, YouTube, Behance, and others offer a wide variety of options as well as optimized content management. But none offer the overall flexibility of a native domain. Further, crawling and indexing social sites may not be as optimal as a dedicated site. Publishing Content Management System (CMS) web site or blog usually means a one-look theme that’s template based. I publish to both platforms: HTML material to my site, and this blog for short updates like this. What this means is that my dot-com web platform maintains a consistent look with the option of inserting one-off pages if desired. 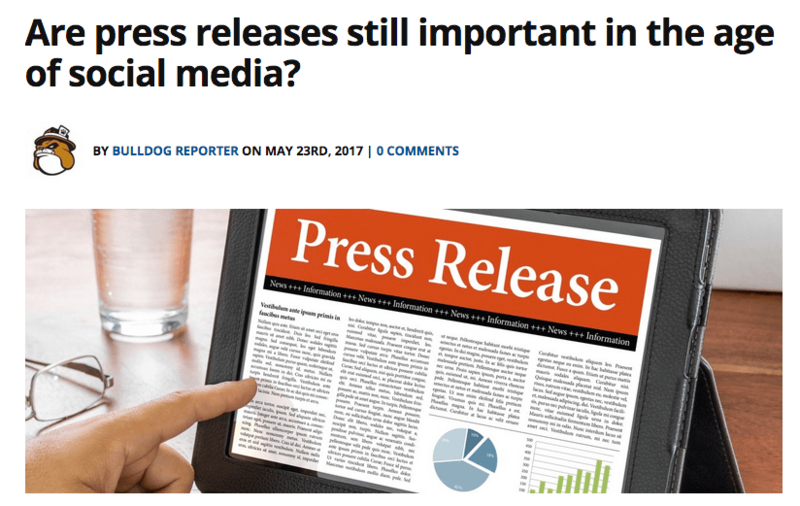 Most small businesses should find blogging only very well suited to establishing a reputation for customized content, especially if that blog is self-hosted. Once you’ve decided on a workflow and have begun publishing, the next step is promoting that quality content. Today, that means social media and email. While it’s obviously impossible to cover the entire spectrum of social media, the trick is to focus on a half-dozen or fewer sites and make sure they’re well integrated into your prime channel. This entry was posted in marketing and promotion and tagged content, google, seo on August 26, 2013 by John Siebenthaler. 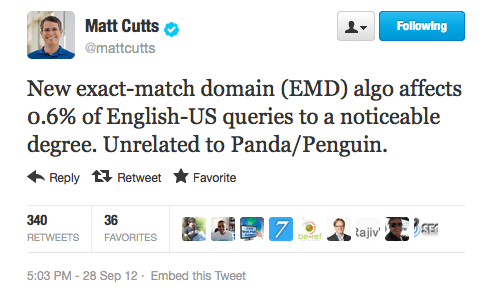 Cute names aside, Google’s algorithms known as Panda, Penguin and who knows what’s next, are getting smarter. That’s good news for site operators who value creativity in their quest for SERP rank. It’s important to keep Google’s goals in the proper context: their consumer is the person who enters a search term and expects to find a quality site in return. Google’s concern is not about individual sites, or the size of those sites. Attention is focused on the individual consumer and how satisfied they are with the results of their inquiry – in short, how well does the search result match up with the consumer’s anticipated result. My own site, Siebenthalercreative.com, has been well received by Google for a number of years for search relating to powersports marketing. The SERP results are fairly consistent, and seem to support the general consensus that quality content is recognized and rewarded by Google. My site is nowhere near the largest nor the most active within the power and motorsports community. It also doesn’t get any advantage from having a sought after search term – in this case, “powersports” – in the domain or page URLs, or even in site directories. If that’s been the major thrust of your search strategy, Google has indicated it may not be enough in the future. My goal since launching the site back in 2002 has been to create an easily navigable property within which is stored a variety of generalized information and industry specific updates, using a combination of individual pages and self-hosted blog posts. The result, after trying to pay attention to the hints and suggestions Google shares with their audience of webmasters, is consistently ranking on page one for searches involving the main marketing functions within the powersports community, including social media. This entry was posted in marketing and promotion, powersports and tagged content, google, page rank, seo, serp on July 8, 2013 by John Siebenthaler. Trying to achieve page rank by relying on a domain name stuffed with keywords just got a lot harder. In an update unrelated to Panda, which puts more emphasis on well designed and written quality content, Google’s latest algorithm begins to make the practice of keyword-defined URLs obsolete and thus encouraging (forcing?) content managers to develop rank organically by adding meaningful content. It works for me. 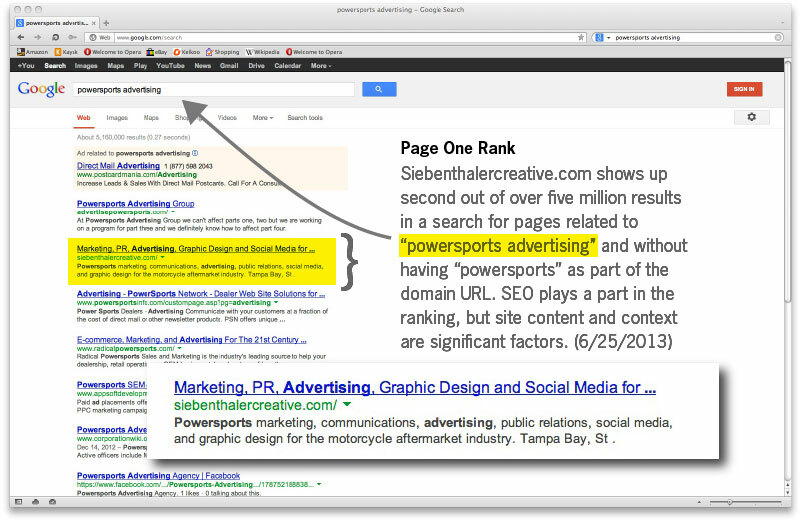 Googling “powersports (advertising – marketing – pr)” usually results in page one rank for Siebenthaler Creative. 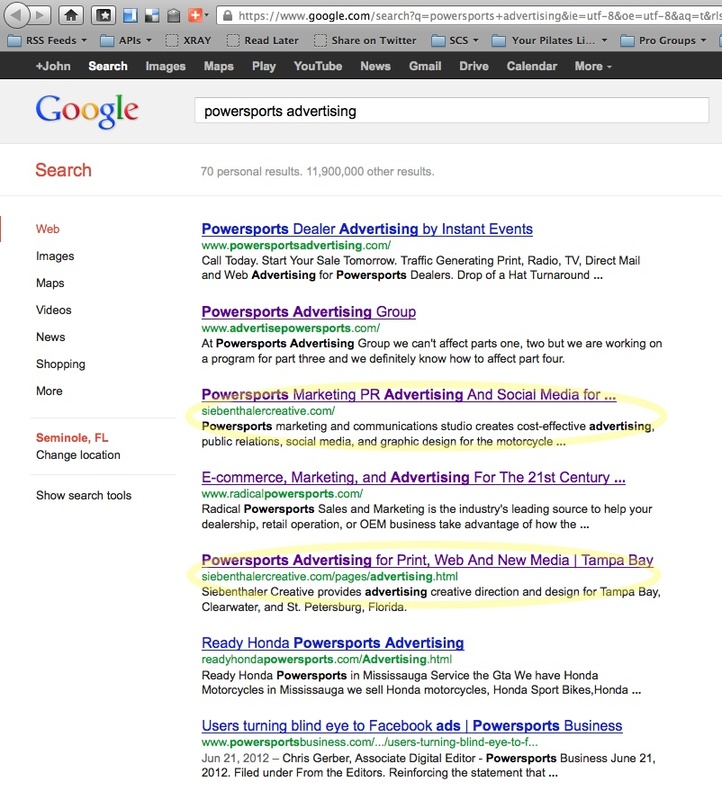 In September 2012 screen grab below Siebenthaler Creative is the only SERP that doesn’t have “powersports” in the URL. This query returned two of my pages based on “powersports advertising,” more on subsequent SERPs. Bottom line: if the goal is to be seen by as many as possible, you need a strategy that doesn’t depend on shortcuts, and one that can survive and adapt over time. 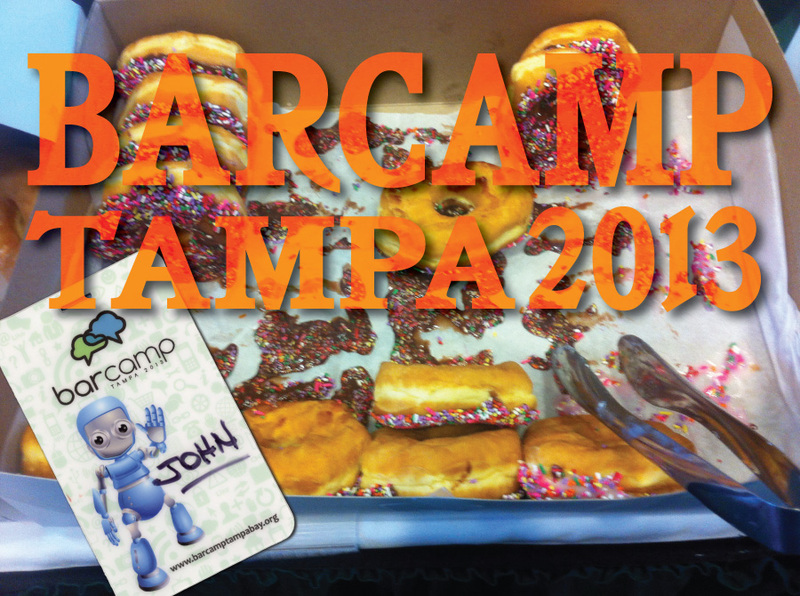 This entry was posted in digital media, marketing and promotion and tagged google, marketing, seo, social media on October 4, 2012 by John Siebenthaler. Two aspects of internet strategy have consistently made headlines in the year just passed: social media and search engine optimization. We’ve been working hard in both areas and we’re pleased to see our efforts pay off with an earned number three page one ranking for the search term “powersports advertising” (minus the quotes). This is significant because neither “powersports” or “advertising” are part of the site URL. What’s it mean? That anyone looking for powersports advertising help online will see us in the top five. Meanwhile we’ve just rebuilt the site and are looking forward to adding new content and interactivity over the next few months. And we’re taking aim on the top spot. This entry was posted in marketing and promotion, web and tech and tagged google, page rank, search, seo on January 18, 2010 by John Siebenthaler.